Every Jimdo website is different, but underneath the surface they are all made of the same parts. These are arranged in different ways, depending on the template you pick. There are five parts you should get to know before you start your site: your Header (Hero area), Navigation, Content Area, Sidebar, and Footer. Once you have an idea of what each part does and what it looks like, you'll be building your site in no time. The Header (or the Hero area) appears at the top of your site. This is typically where you would put your logo and website name. Some templates have large, central header areas, while others have smaller ones over to the side. Keep in mind that your Header will appear the same on every page of your website. See below for a side-by-side comparison of these parts in two different templates. If you don't have a logo yet, just leave the logo area blank. 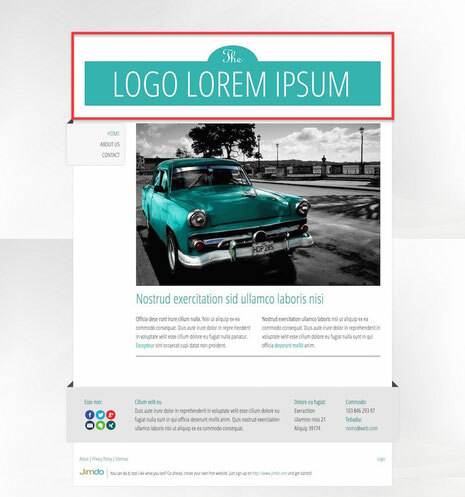 Read more about setting up your logo and header text. Havana template with its central header highlighted in red. 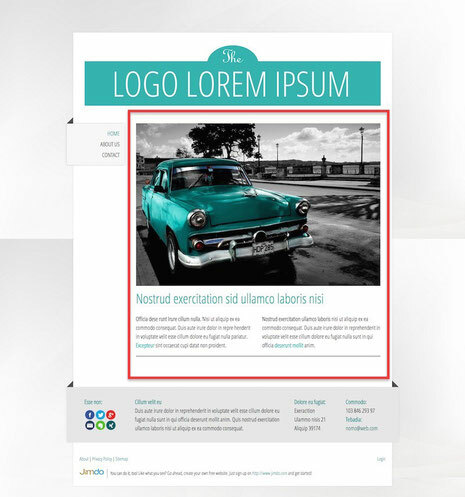 St. Petersburg template with left-aligned header highlighted in red. Your Navigation is the menu that directs people to different pages of your site. Some people also refer to this as their menu bar. Jimdo navigation bars come in different styles: breadcrumb, drop-down, slide-in, and normal. (You can see which template has which navigation bar in our Template Filter). They can also be horizontal or vertical. The navigation you choose will depend on the amount of content you have, the number of web pages you need, and your design preference. 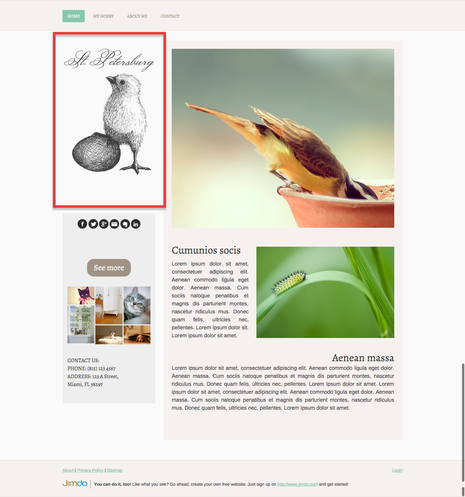 Read more about the different types of navigation menus here. The Havana template has a vertical navigation. St. Petersburg template has a hortizontal navigation. The Content Area is the “body” of your website, and the place where you will add most of your elements, like text and photos. Each page of your website can have a different Content Area, making it one of the most flexible parts of your site. The Havana template's content area. The St. Petersburg template's content area. The Sidebar is your secondary content area, usually a narrow strip on the side of your web page where you can add additional elements. The sidebar will show up exactly the same on every page of your site. It’s typically where people put contact information, social media links—anything important enough to show up on each page. Depending on the template, your sidebar can be on the left, right, or even on the bottom (meaning that “sidebar” is sometimes a misnomer…it can be a “bottom bar” too). The Havana template's "sidebar" is actually at the bottom. The St. Petersburg template has a sidebar on the left side. Hide your login link by opening the Menu and going to Settings > Website > General. Once you hide this link, you can still log in to your website by appending “/login” to your website address (e.g. http://www.yourwebsite.com/login). You’ll also see the option to remove your other footer links here, should you wish to do so. Got it? Great! Now you're ready to move on to Choosing a Template for Your Website.